The Hills was cancelled by MTV six years ago, but the love between reality TV casualties Heidi Montag and Spencer Pratt endures to this day. In April 2016, the pair will celebrate their seventh wedding anniversary, even though their fame and money have largely dried up, and they are currently living in Spencer’s father’s Santa Barbara beach house, gorging themselves on other people’s reality shows and wondering what to do next. 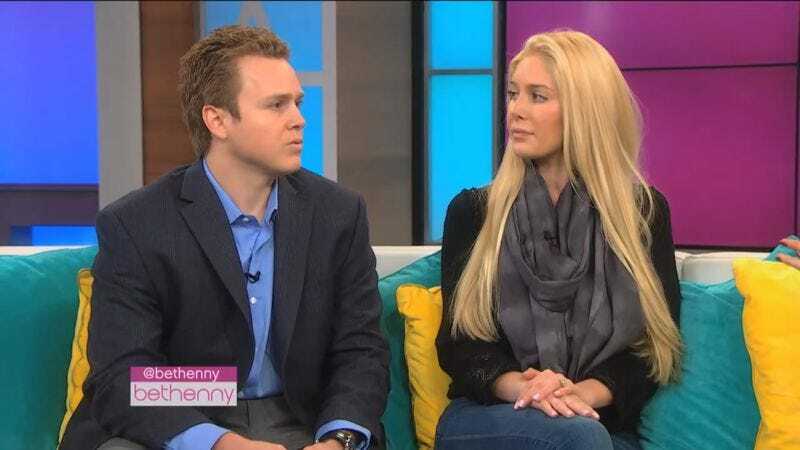 Broadly’s Mitchell Sunderland recently spent five months getting to know Montag and Pratt, and he has now filed a largely sympathetic report about them entitled “Head Over Hills: The Undying Love Story Of Heidi And Spencer Pratt.” The world may have written them off as vain, shallow, narcissistic idiots, but these two really do share an abiding spiritual connection. The best and worst one can say about them is that they truly deserve each other. During the heyday of The Hills, the article reveals, Montag and especially Pratt willingly played villains on the reality-based soap opera. If that meant lavish shopping sprees, marathon partying, and staged arguments, so be it. The goal was to shift the program’s focus from star Lauren Conrad to “Speidi,” as the couple came to be known. That mission was handily accomplished, but it came with some hefty long term penalties. Pratt was a reality TV insider and knew how to manipulate the tabloid press for maximum effect. What neither he nor Montag anticipated, however, was that the public would take all of this at face value. To Speidi, this had all been a game, a way to entertain America and make some serious cash in the process. The all-too-real public backlash was a nasty surprise. Perhaps the strangest, saddest passages in Sunderland’s story deal with Montag’s controversial decision to undergo 10 plastic surgeries in a day, an ordeal that nearly killed her. She was trying to counteract some negative internet comments about her appearance, the story says, and the couple figured that the stunt would also draw attention back to The Hills and away from MTV’s then-surging Jersey Shore. Details like this make Sunderland’s article read like a chilling cautionary tale about the downside of pursuing fame at all costs.